We were also mentioned on The Groton Channel. Our mention starts at 3:54 in the video from the October 16th Groton Channel News Flash. Check out our latest story in the Nashoba Valley Voice! Thanks for the interview opportunity, Mary-Ellen Jones! Thanks for the coverage Groton Channel! Just a quick programming note, this clip mentions a 2pm performance on Saturday in error – we only have 3 performances: Friday, January 12th at 8pm, Saturday, January 13th at 8pm, and Sunday January 14th at 2pm. 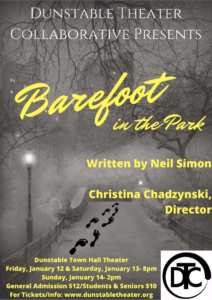 Join Dunstable Theater Collaborative for our group’s inaugural performance of Neil Simon’s Barefoot in the Park at Dunstable Town Hall, 511 Main Street, Dunstable, MA! Auditions will be at Dunstable Town Hall in the Main Hall, upstairs. Auditions will be conducted via cold reads of scripts. There is no need to prepare a monologue prior to your audition. Please contact us at info@dunstabletheater.org to reserve a time slot, and we will accommodate you to the best of our abilities. You may email us any questions you may have as well. We will accept walk-ins as well, but there may be a wait. Please be prepared to fill out an audition form upon arrival. We will take photographs to help remind us who each person is. Thank you for auditioning and break a leg!